In an environment where the quantity of content is ever increasing ("on-air” or "on-demand" from your television, VOD from your digital device) and the consumption context is expanding (from your living room couch to "up in the air" at 30,000 feet to the line at Starbucks), how do we ease the burden of content and app discovery? Given new modes of content creation and distribution, what are the monetization models that will satisfy all participants in the ecosystem through profitability for the content creators and distributors and delight for the consumer? But most importantly, what is the second screen? The definition of "second screen" has gone through more iterations than the attractions across the street. In my presentation "The New Dynamics of Second-Screen Content," I outlined the current state of the "second screen" and focused on several technologies that are enabling new models of content programming and delivery. So, What is the Second Screen? In a "utility" model, the mobile device is - in the best case - a sophisticated controller or - in the worst case - a very pretty remote control. Real Racing 2 HD and MetalStorm are two popular iOS games that utilize the mobile device as a "heads up display" - providing an extension of gameplay between the television and your handheld device. Many television operators have released EPG-type applications. I've spent countless hours using the DirecTV application to view simulcast content (though sports seem to be the most common content that is not enabled). The primary function is a glorified remote, a function that I discovered accidentally when I started changing channels in one room and my spouse began complaining that we needed to switch to another provider because our receiver was randomly switching channels. Most second screen applications today fall into the category of "social" or "participation" applications. These applications typically involve some type of user check-in (a la Foursquare) or social identity login. Common features include check-ins, discussions (comments, tweets), interactive polls, and related content (e.g., information about the cast and characters, photo galleries, and additional video). While many of these social/participation applications include audio content recognition to trigger content on the mobile device from the television broadcast (live or pre-recorded) or to synchronize content on the mobile device with the television broadcast (live or pre-recorded), this model has a number of challenges. First, the model is passive; the experience on the mobile device is secondary - and often optional - to the content on the television. Second, experiences that are tied to live broadcasts become stale for time-shifted viewing. One second screen experience prompted me with "please try again later" while another stated it would "contain spoilers." Third, many of these experiences are social at heart, deriving their inherent value from publicly available user-generated content and activities (check-ins, tweets, and polls). Our Televisions are Already "Smart" and "Connected"
Over the last several years, we've seen a radical shift by television manufacturers to create "connected" and "smarter" televisions. This usually means that the television is Internet-enabled (wired or wireless) and supports the notion of applications (built-in or via a storefront, similar to the Apple App Store or Google Play). While I’ll use any excuse to justify a slimmer, larger, or "better" television, I admit that television manufacturers have not been able to innovate as quickly or efficiently as alternative device platforms: game consoles (e.g., Xbox) and connected devices (e.g., Roku, Apple TV). With an Apple TV, Internet connection, and HDMI cable, practically any television is "smart" and "connected." Tablets and smartphones will continue to remain separate form factors that have different uses by consumers for lean-back experiences within the home. Smartphones are appropriate for texting, tweeting, and even calling during a lean-back experience but not ideal as the primary mobile device for the dual screen experience. Aside: While there have been attempts to blur the lines between the smartphone and tablet form factors, we’ll save the debate for another blog post. Until then, the line between desktops and laptops, laptops and tablets still remains thick. I doubt we’ll see true convergence of the tablet and smartphone anytime soon. In the dual screen model, the relationship between the television and the tablet is reversed. The tablet is the primary device, interfacing with and controlling the television, which essentially becomes a - for lack of a better description - dumb terminal, relegated to requesting and rendering video content. In a dual screen experience, as video content is displayed on the television, the application can engage the viewer with relevant and education activities, from content reinforcement to spelling to trivia to memory "games." One can imagine an interactive amalgamation of Dora the Explorer, Where in the World Is Carmen Sandiego?, and Schoolhouse Rock! The first opera I attended was Der fliegende Holländer at the Metropolitan Opera House. Unfortunately for me, four years of German was of limited benefit [apologies, Herr Engelmann, I should have paid more attention during class]. Fortunately for me, the Met provided the translated libretto (synchronized to the performance) via an electronic display on the seat in front. In a dual screen experience, as video content is displayed on the television, the application can provide synchronized display of the libretto - or in a broader sense, captions and subtitles - as well as more immersive annotations. One can imagine an interactive version of [my personal favorite] The Annotated Alice or similar experience on the tablet synchronized to the video content. Let's face it, in-stream advertising is an exercise in patience as ad loads increase, often without a change in the variety of ad creative. In a dual screen experience, as advertising content is displayed on the television, the application can deliver a more engaging experience on the tablet: displaying additional information about the brand/product/service being promoted, providing mechanism for user participation (e.g., newsletters, "share X to be eligible for Y" promotions), and even enabling the user to affect the future advertising content or frequency (e.g., "Would you like to watch a five minute video on X and enjoy the rest of the video without commercial interruption?"). There would likely need to be support from agencies, advertisers, technology vendors, and standards bodies before this becomes commonplace, but for publishers looking to create sponsorship opportunities for tent-pole programming, dual screen creates opportunities to expand beyond the traditional pre-roll, mid-roll, and post-roll. I admit it, I was a fan of the Choose Your Own Adventure series of gamebooks. For those that aren’t familiar with the series, the concept was the reader was forced to make decisions and skip to another page in the book to continue that particular storyline. One can think of it as a children’s book combined with HyperCard. The stories were simple, but the model encouraged readers to start over and create a new journey every time. In a dual screen experience, as video content is displayed on the television, the application can enable the user to affect the video content on the television - not by selecting a new discrete program - but by dynamically sequencing content “bits” into a personalized sequence that’s changing and evolving as a transient experience. One could imagine the ability to watch sports highlights and - through your own on-the-fly decisions - create a dynamic playlist of content that transitions seamlessly from a highlight of Tiger Woods winning the Arnold Palmer Invitational … to an update on the Stanford [his alma mater] men’s basketball team looking to repeat in the NIT … to a recap on the Stanford women’s basketball team beating Tulsa … to Coach Tara VanDerveer's Basketball Hall of Fame acceptance speech … and back to Tiger’s thoughts on the upcoming Masters. There are several technologies that can enable this type of dual screen video experience, with Apple's AirPlay being the most prominent and readily available. AirPlay is Apple's proprietary protocol that has been available for several years (though the earlier AirTunes incarnation supported only audio) though it has only slowly gained adoption by developers and consumers. Many people are familiar with the use of AirPlay as a mechanism to either broadcast audio to AirPlay-enabled devices (e.g., speakers) or to mirror the contents of their iPad (or iPhone) on an AirPlay-enabled device. 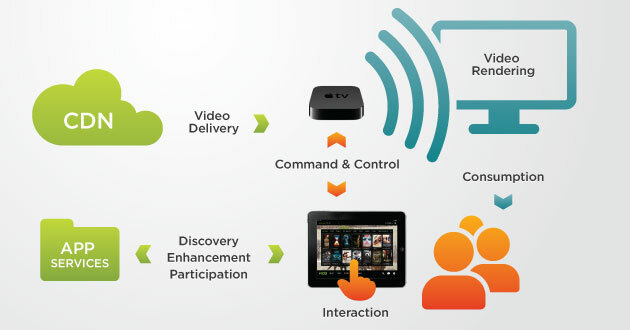 From a development perspective, AirPlay is available today and many applications (from games to video applications) take advantage of this capability, though most video applications utilize AirPlay in a limited fashion, isolating the video consumption experience: when a user chooses to use AirPlay, they are prevented from using the application for other actions (e.g., discovery, sharing, etc.) or the application stops video playback. Instead, these applications should be embracing the dual screen model and allowing the user to do both. Aside: Apple still has some bugs to remedy; the most notable issue is the momentary display of the Apple TV menu between discrete videos and/or advertisements. While server-side stitching (e.g., dynamically creating an m3u8 playlist from individual videos and/or advertisements) is feasible, this is a functional defect that I hope Apple will fix to allow developers to choose between client-side and server-side implementations. Today, AirPlay is limited to only the iOS ecosystem; however, recent announcements foretell similar capabilities for Android. The most similar technology is the Wi-Fi Alliance's Miracast, which is likely to be Android-centric. Embraced by Google (they tout Miracast support on Android 4.2), Miracast is only available on Wi-Fi Direct supported devices. While Miracast has gained momentum, it will need to focus on ensuring both Android consumers and developers understand the technology and capabilities, especially if device manufacturers continue to rebrand Miracast under differing terminology, e.g., "AllShare Cast." In addition, YouTube and Netflix have teamed up to promote DIAL (Discovery and Launch). However, DIAL isn't dual screen; DIAL still considers the television to be the primary screen. DIAL promotes the core capability as the ability for a mobile device to launch an application on the television. DIAL is less dual screen and more device pairing. Over time, DIAL will find its role in simplifying the interaction between applications on devices and applications on television. However, the road to dual screen will remain one paved by AirPlay and Miracast. The biggest threat to dual screen is the existing conflict within the living room as to who "owns" the television. I've spoken with several broadcast programmers who were excited about the possibilities of dual screen. However, their initiatives were put on hold until they could determine if the use of AirPlay - effectively using their tablet applications to bypass the set-top box - would adversely affect their relationships with their MVPDs. Based on the evolution of AirPlay and the introduction of Miracast, I'm optimistic about the ability for dual screen to create compelling, engaging, and innovation video experiences that delight all participants: publishers, advertisers, content owners, and consumers.